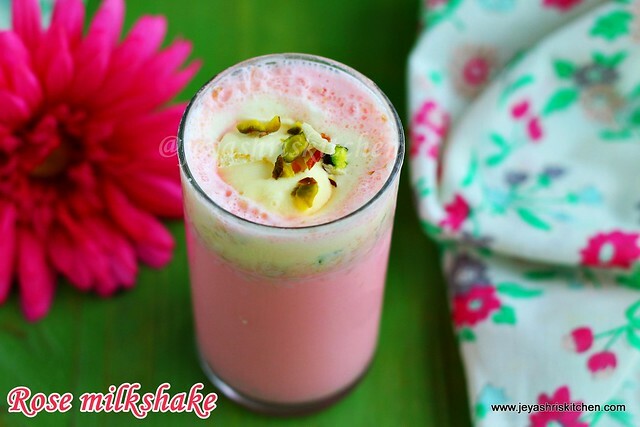 Rose milk shake recipe is influenced by Sri krishna sweets and MTR rose badam drink. I am a huge fan of rose milk from my childhood. Amma used to make this for us almost everyday in summer. We used to make rose milk popsicle in freezer trays and enjoy during summer vacation. Whenever i travel to Chennai, i buy this Rose badam drink bottle in Sri Krishna sweets and but Madras Mixture for kids as they are a big fan of that. I wanted to make it simple and serve it as a milkshake. I added few more nuts apart from badam. It tasted so yummy and kids loved it too. Check out my badam milkshake. * I used almonds, cashew and pistachios. **I used haldirams rooafza syrup. Soak the nuts and cardamom in hot water for 15 minutes. Take out the skin of the almonds and pistachios. Take out the skin of the cardamom. In a mixie add the nuts, cardamom seeds, milk and rose milk essence. Since i used rooafza i didn't add sugar. Beat this in the mixie. Let the nuts be coarsely ground. Just whip in a mixie 2-3 times. Pour this into a tall glass. 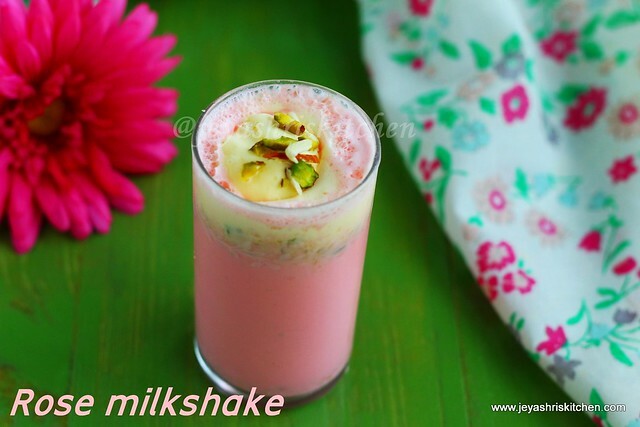 Fill the glass 3/4 th with the nutty rose milk mixture. Scoop one big portion of vanilla ice cream on the top. You can add a pinch of saffron and a few drops of rose essence while grinding. If using rose milk essence or powder add sugar as per your taste. You can add ice cream while grinding too.